Some people call it their village. Some call it a tribe. It doesn’t much matter what you call them, but finding mom friends is a definite game changer when it comes to motherhood. 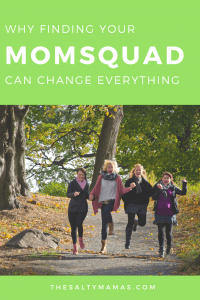 We can tell you beyond a shadow of a doubt- our MomSquad has changed our lives. When our kids were babies, Christine and I, along with about 80 other mamas in our area, met in a series of blind dates Mommy Meetups listed on Meetup.com. Those first few meetings were a little bit weird- we were strangers, we were adult-conversation deprived, and we were terribly ignorant about how to parent these little creatures that had been entrusted to us by the universe. Most online Mommy Groups are dens of conflict and judgement and sanctimony. And as the kids got older, I continued to Ask the Mommies. Our coffee dates became park play, and our music classes turned into a Co-Op preschool group. I harbored a deep, dark fear that as our kids continued to age and began to pick their own friends, that I would lose my friends in the process. Now Lila is five, and her best friend is a little lady on the next street who was not a part of our original crew, and I still consider The Mommies to be some of my very best friends. True, some friendships have faded, and our group ebbs and flows as some move on and others join in. Our playdates have turned into post-bedtime-cocktails and second-baby-showers, and our Co-Op group is more busy going on cruises than homeschooling these days. But honestly? That’s not exactly a downgrade, am I right? So if you’re just starting out on this parenting journey- find your people. Find them at the park, at the gym, online- just find them. And then keep them. 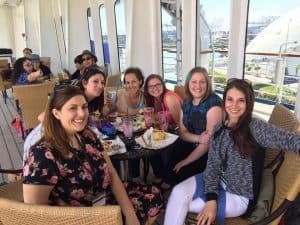 Because at some point, the “Mommy” part of “Mommy Friends” may just fall off, and before you know it you’ll be kid-free, toasting each other on a boat sailing off into the great blue sea. 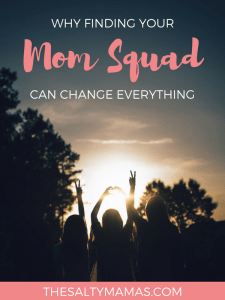 Now it’s your turn to tell us about your #momsquad in the comments. We want to hear about the women who hold you up when you feel like falling down, and the ones who buy you drinks and celebrate your successes with you. Brag about YOUR Mommies below! And if you haven’t found your MomSquad yet? We’ll be your tribe. Make sure you are following us on Facebook, and look out for a big announcement coming soon! Big announcement!? Oooo Salty Mamas, what are you up to over there? Love this! So many good memories with the group *happy tear*. I equally suggest to all moms to find a group or mom friends.